JV Baseball: Saturday, May 24th, the JV baseball double header against South Bend Adams will now be played at Phend Field instead of Rogers Park. The start time is at 10:00 am. Varsity Baseball: Saturday, May 24th, the varsity baseball double header against South Bend Washington will now be played at Goshen College instead of Phend Field. The start time is at 10:00 am. On Wednesday, May 21st at 4:30 pm, Goshen HS will be playing against Bethany Christian HS in the IHSAA Tennis Sectional hosted at Goshen Middle School. The winner of that match will advance to the 2nd round. On Thursday May 22nd at 4:30 pm, Fairfield HS will be playing against and Jimtown HS. NorthWood HS will be playing against the winner of the Goshen and Bethany Christian match. The championship match will be played Friday, May 23rd at 4:30 PM. Softball Redskin Classic: On Saturday, May 24th. 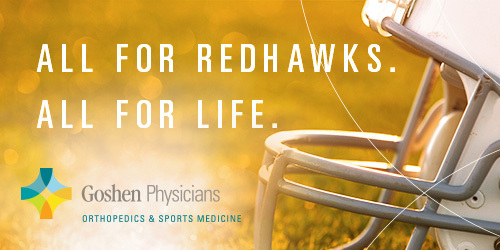 Goshen High School will host the Redskin Classic. The games start at 9:00 AM. Goshen will play against Elkhart Christian on diamond 3 at Shanklin Park. Bethany Christian will play against Westview on diamond 2. 30 minutes after last out of 1st round the winner will play and the non-winners will play. Tennis Sectional: The Goshen tennis sectional tournament begins on Wednesday, May 21st at 4:30 pm. Semi-finals are on Thursday, May 22nd at 4:30 pm. Finals are on Friday, May 23rd at 4:30 pm. Boys Track and Field Sectional: On Thursday, May 22nd Goshen High School will host the boys track & field sectional meet. The field events will begin at 5:30 PM. The 4 x 800 m Relay will begin at 6:00 PM. Teams involved are Concord, Elkhart Central, Elkhart Christian Academy, Elkhart Memorial, Goshen, Fairfield, Jimtown, Northridge, NorthWood, Warsaw, and Wawasee. The only entrance is the main entrance by the concession stand. The entrance north of the home bleachers will not be open. Please park in the west parking lot. A meet program can be found at ghs.goshenschools.org as of noon on Monday, 5/19. Admission price is $ 6.00 for kindergarten to adult. Goshen High School All sport tickets and Goshen High School student activity cards will NOT be honored. C Baseball time change: Thursday, May 15th, the c baseball game against Penn has a time change. The game will be following the JV baseball game. The start time is 7:30 pm. Varsity Baseball: Tonight, May 14th the varsity baseball game against Plymouth has been postponed to tomorrow, May 15th. The start time is 5:00 pm and the game is played at Phend Field. JV Baseball: Tonight, May 14th, the JV baseball game against Plymouth has been postponed to tomorrow May 15th. The start time is 5:00 pm and the game is played at Rogers Park. JV/V Softball: Tonight, May 14th, the JV and varsity softball game against Plymouth has been postponed to tomorrow, May 15th. The start time is 5:00 pm and the game is play at Centennial Park. For the third year in a row, Goshen High School has earned a silver placing on the U.S. News & World Report’s list of the best high schools, this year, ranking as the 29th best high school in the state of Indiana. The U.S. News and World Report analysis of Goshen High School highlights its International Baccalaureate program and GHS’ IB participation rate of 24 percent. College readiness through programs like IB is a major component of U.S. News & World Report’s study of high schools. 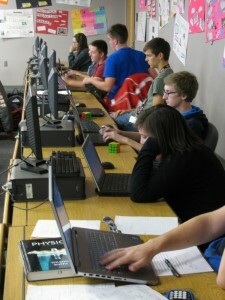 U.S. News & World Report ranks high schools by looking at schools’ reading and math scores on state standardized tests and comparing those with how students in that state are statistically expected to perform, also factoring in the percentage of economically disadvantaged students and if those students perform better than statistically expected. Schools scoring high enough in that part of the process then go on to step two where U.S. News & World Report looks to see if the school’s least-advantaged students (black, Hispanic and low income) are performing better than the state average for those groups of students. Schools performing well enough there are then judged on college readiness performance, either through success with Advanced Placement or International Baccalaureate. Schools doing well through all three steps are assigned a gold, silver or bronze award and then sorted into national and state rankings. This year, GHS ranked 29th out of the 370 Indiana high schools on the U.S. News & World Report list. GHS ranked 1,765 in the nation out of 19,400 high schools, according to U.S. News & World Report. Goshen High School has continually ranked well on the U.S. News and World Report’s Best High Schools rankings. In 2012, GHS was named the 12th best high school in Indiana. Find out more about U.S. News & World Report’s analysis by clicking here and about the ranking’s looks at Goshen High School by visiting here. Thursday, June 5th. Baccalaureate is an optional religious celebration of graduation planned and lead by other seniors. Attendance is completely optional. If you would like to attend, you need to be in the cafeteria WEARING your cap and gown by 5:40. We will walk in slightly before 6. Thursday, June 5th: This is an evening where seniors are recognized for scholarships and other awards they have received. Attendance is open to all seniors. If you will be receiving an award or a special recognition, you really should attend. The guidance department will notify you closer to the date if you are being recognized. If you are attending this event, please be in the Cafeteria WEARING your cap and gown by 6:30. We will walk in slightly before 7. All seniors planning to participate in graduation MUST attend the mandatory graduation practice. This practice will take place during seventh hour (2:00-3:40) on Friday June 6th in the cafeteria. This is the last day of school, the last period of the day. You do not need to wear your cap and gown. YOU MUST ATTEND THIS REHEARSAL IF YOU PLAN TO PARTICIPATE! You must be in the cafeteria BEFORE 1 pm! There will be a name tag on your seat in that room, as well as in the gym. Seating is alphabetical. You MUST wear a cap and gown: red for males, white for females. 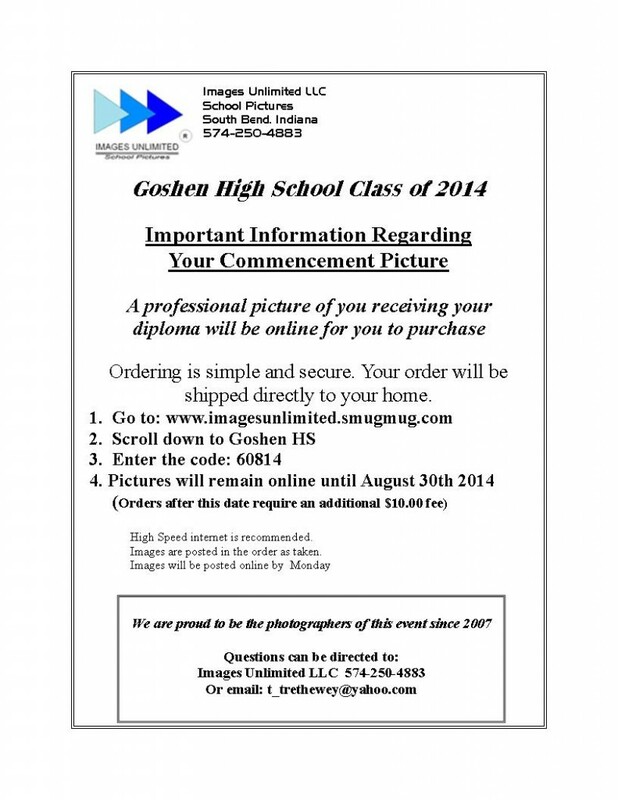 If you have not yet purchased or picked up your cap and gown, please see Ms. Van Elk in room 2290. Ladies, wear something light colored because your robes are white. Normally girls wear a dress and nice shoes. Gentlemen, wear something nice. A shirt and tie is what is expected. No flip flops. No jeans. Wear nice shoes. No sun glasses. No chewing gum. If you walk, you must have a cap and gown or a class A uniform, if in the military. *IF YOU ADD ANY “DECORATIONS” to your cap and gown you will have to buy a new one to walk in the ceremony, or you will not be able to walk. Participating in the graduation ceremony is a privilege, not a “right.” Please be respectful of the seriousness and significance of the ceremony. If your family needs space on the gym floor, (parents or grandparents are in a wheelchair, or cannot go up the bleachers) you must tell Mrs. Clark or Ms. VanElk. We will reserve seats for you under your name, but your family will still need to arrive early. At 1:40, reserved seats will be released if no one is there. Each senior will receive 6 tickets to graduation in their SRT May 13 and 15. People without tickets will not be allowed to enter the gymnasium. There will be “overflow” seating in the auditorium. Guests may not bring balloons, large items, or noisy items into the gymnasium. If you would like more than 6 tickets, you may put your name on a waiting list in the main office, but there are no guarantees. When Jonathan Santiago Jimenez graduates from Goshen High School this spring, he’ll be well on his way to one day owning his own restaurant. 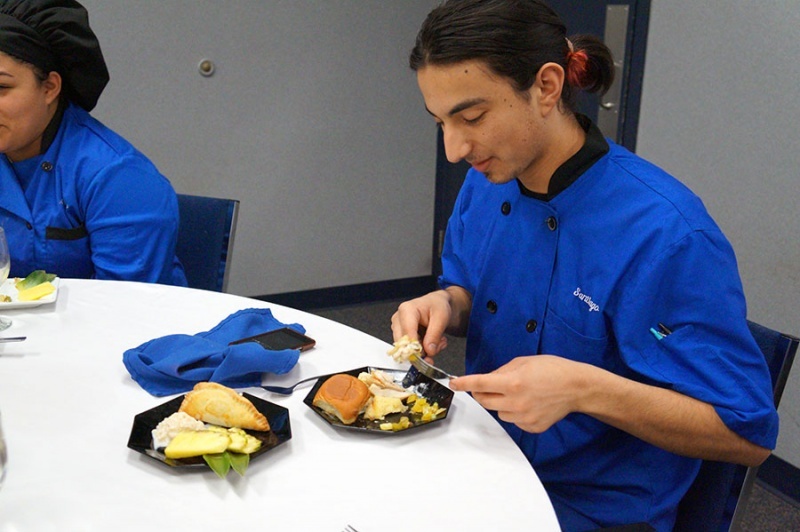 Jimenez is finishing up his work in the Elkhart Area Career Center’s culinary arts program, where’s he earned dual credit through his two years in the program. He plans to attend Ivy Tech Community College in South Bend next fall to earn his Associate’s Degree. He’ll also graduate with a High Schools That Work (HSTW) Award of Educational Achievement from the Southern Regional Education Board (SREB) for completing a challenging program of study and demonstrating readiness for employment and for college. Jimenez said he’s always been interested in culinary arts and always knew he wanted to grow up to become a chef. “It’s something everybody can relate to. Everybody has to eat and if you can make it taste good and look good, that’s really great,” he said. Along with the High Schools That Work award, Jimenez was one of the top 10 students in the Skills USA State Leadership and Skills Conference culinary arts contest in Indianapolis earlier this month. He entered that competition with his classmates through the Career Center, but also pursued on his own entrance to a Chopped Scholarship Competition, sponsored and organized by the Food Network TV show. Through the contest, regional winners competed against each other for a $40,000 scholarship to culinary school. Jimenez was the runner-up at the regional held at the Art Institute of Chicago just a week after his contest in Indianapolis. Margarita McClain, a culinary arts instructor at the Elkhart Area Career Center, said that Jimenez has a natural talent. She is impressed by his drive to pursue his dream of becoming a chef. “He’s definitely got a passion for it and is going for it,” she said. 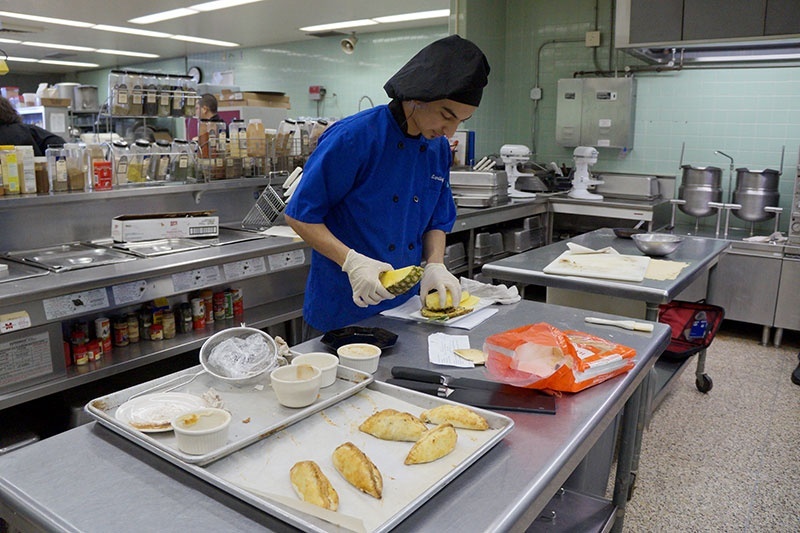 As a final project at the Career Center’s culinary arts program, Jimenez created a meal fusing Bolivian and Hawaiian flavors. The menu included a chicken salad with pineapple, Hawaiian rolls with a pineapple glaze, Bolivian salteñas (a meat, potato and pea mixture in a flaky pastry) and rice pudding. Along with wanting to become a chef, he would also like to be on the culinary skills show that he’s watched since he was a little boy, Iron Chef. He noted, though, that he’d love the challenge of being on any culinary TV competition. Jimenez and other High Schools That Work award recipients at the Career Center will be honored at an event in May. William Kovach, Elkhart Area Career Center director, will present the awards at the end of the year awards banquet on May 8, 2014, at 7:00 p.m. at Elkhart Memorial High School.